Seen the monuments of Luxor before? 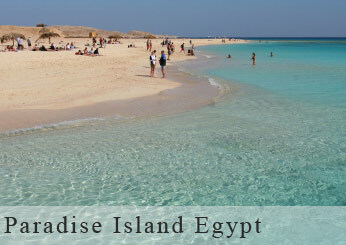 Then why not head for a lovely little island where you can swim, relax and soak up all that hot Egyptian sunshine? We'll take you to the marina where you'll board a private motor-boat that'll whisk you off to Paradise Island. Part of the Maritime National Heritage of Egypt, it's real postcard stuff all right. Once you reach the island, the time is yours to stroll along the sands, swim in the crystal waters or sail out to sea for an hour's snorkelling. The island is at the southern tip of a beautiful, 2km-long reef, so you're guaranteed an incredible underwater experience. Afterwards, tuck into a delicious buffet lunch, perhaps take another dip in the sea, then head back to the marina where your coach will be waiting to take you back to the ship. It's a great way to recharge your batteries. Suitable for elderly people but not with walking limitations, unsuitable for the physically restricted. Launch will dock at Paradise buoys on arrival and pax will transfer to motor boats for the beach at Paradise. Toilet facilities and sun deck available on launch. Guests may change into their swimsuits on launch or at the restaurant's changing room at Paradise beach. Boat takes maximum 33 persons. Participants need to bring own towel. Participants who do not snorkel transfer to motor boats at the buoys upon arrival at Paradise for a swim or relax on the beach. The others remain on launch for a snorkelling trip around the island, lasting one hour, returning on time for lunch with those who are on the beach. Sun hat, sunglasses, sun block, highly recommended. Beach attire and comfortable beach shoes in case they get wet must not become uncomfortable or create a problem. Restaurant has rest room facilities where people change into their swimsuits. Sun mats and umbrellas made from reeds available at no extra cost. The island is a nature reserve and everyone must leave by 4.30pm! !